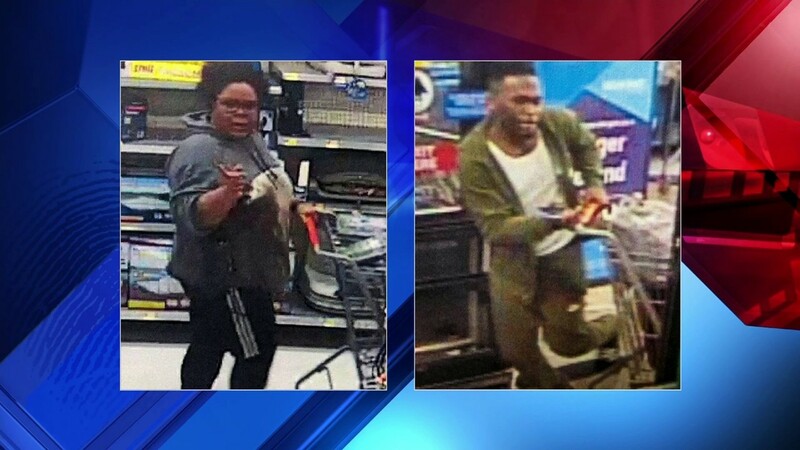 FERNANDINA BEACH, Fla. - A man and a woman suspected of stealing from a Walmart took off from the store and, in the parking lot, hit a pedestrian with their car, police said. The suspected theft took place about 7:30 p.m. Friday at the Walmart store on Amelia Plaza, according to the Fernandina Beach Police Department. "As suspicion of their actions grew and associates began to watch them, (the pair) became anxious and fled the store," officers wrote in a release. Police said surveillance video showed a woman exiting the store, getting into a silver Mercedes-Benz sedan and parking it in a handicap spot. The video also showed the woman placing a bag over the vehicle's license plate, police said. Several minutes later, according to police, the video showed a man bypassing the cash registers with several different items. As he attempted to leave the store, he was approached by a Walmart employee who asked for a receipt, police said. The man produced a Walmart receipt for 96 cents from the River City Walmart, police said. At that point, another employee attempted to stop the man, who then rammed a cart into that employee. The employee was reportedly shaken up, but not hurt. Police said the man then ran out of the store, almost knocking over a customer, and jumped into the Mercedes-Benz driven by the woman. A 58-year-old pedestrian witnessed the commotion as he stood in the crosswalk. According to the police report, the pedestrian tried to get out of the way, but the car sped toward him, striking him and cause him to fall to the ground. The 58-year-old man was taken to a hospital for treatment but was reported to be doing well. As of Monday, according to police, the 58-year-old was continuing to recover from injuries to his back, neck and legs. Police said they believe the duo got away with video games and DVDs. If caught, they face several charges, including theft and aggravated battery with a deadly weapon.